I'll start by saying that picking the right hotel for any adventure is a pretty important task. I've mentioned before that it can sometimes make or break the experience of your vacation. So when Melanie and I booked a last-minute trip Kauai we knew we had to find a place on the beach, have some kind of a view and of course, a pool. Priorities, right? 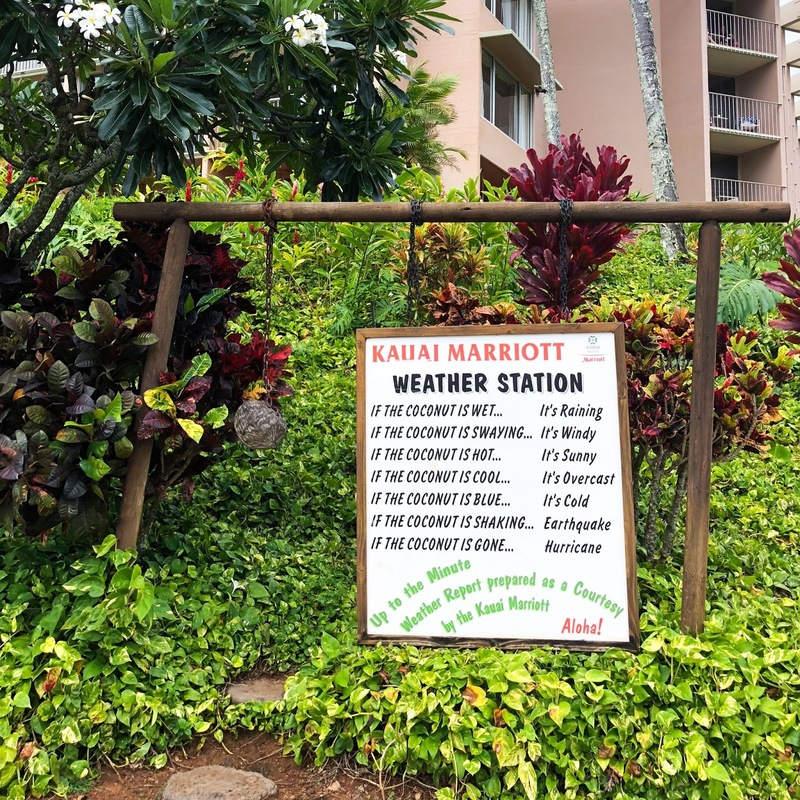 It took some digging but eventually we found the perfect place, The Kauai Marriott resort. After a quick look at their location (it's 5 minutes from the airport), the website, and their offerings it was a no-brainer that they were going to become our home for nearly a week. Like most things I'm always anxious to see how a place holds up in-person after seeing it on the worldwide web but the resort blew our expectations out of the water. It's an understatement to say it's stunning. 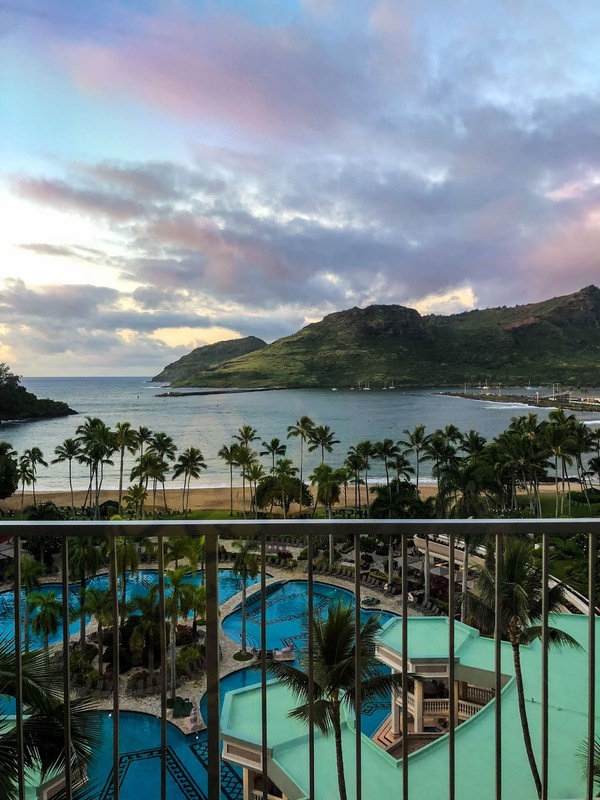 Aside from those mentioned above, I've compiled a list of reasons why Kauai Marriott Resort is a must-stay place on the island- just in case you need an additional nudge in their direction. 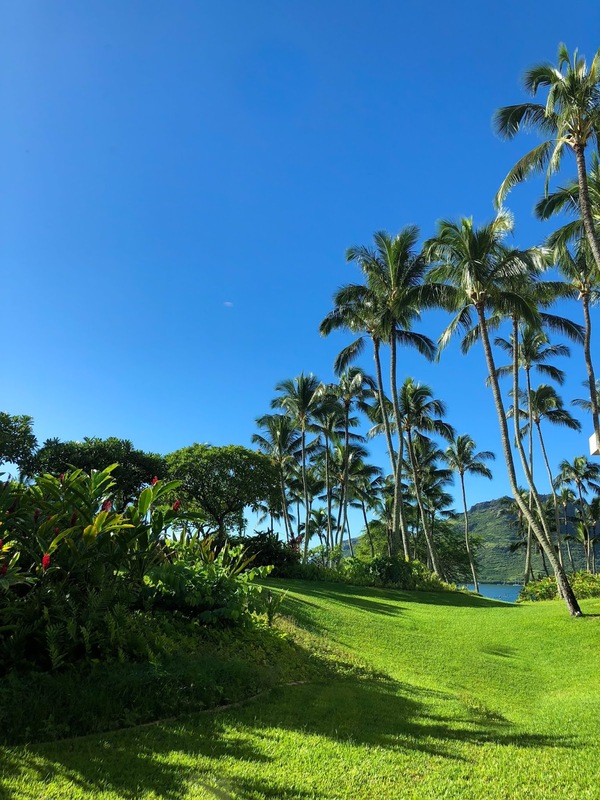 Pulling into the Kauai Marriott Resort's lush scenic property was like out of a dream. 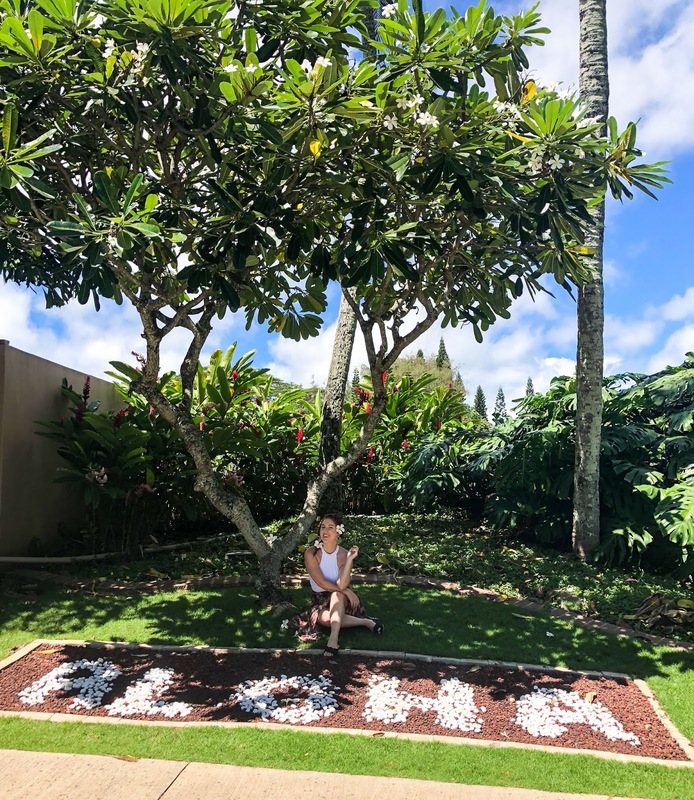 The grounds leading up to the beach are adorned with perfectly manicured tropical plants, flowers and trees. 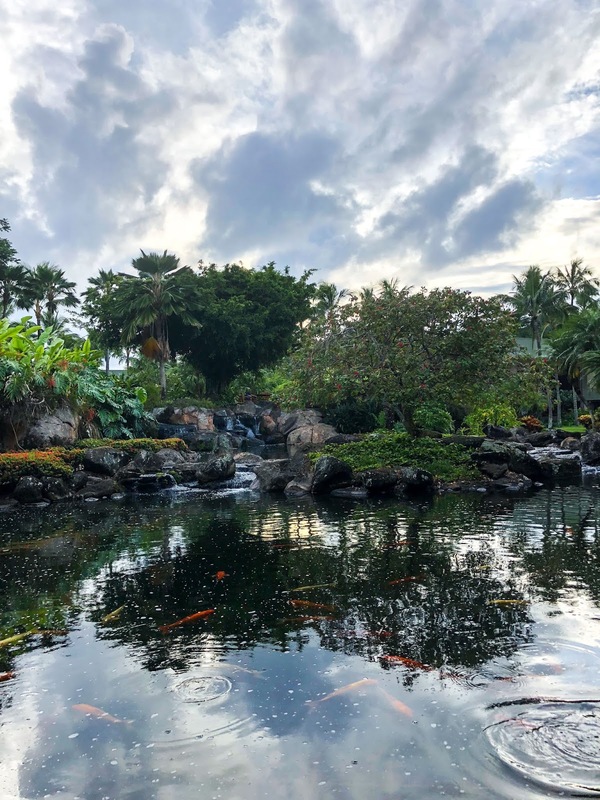 At the bottom of the escalator is an enormous Koi pond with a waterfall and surrounding seating for a moment of Zen before checking in at the lobby desk. It's hard to miss and has daily Koi feedings, which are a sight! Frangipani (Plumeria) trees are spread throughout the grounds making for opportune moments to grab a freshly dropped flower for your hair. Remember, left side for taken and right for looking. 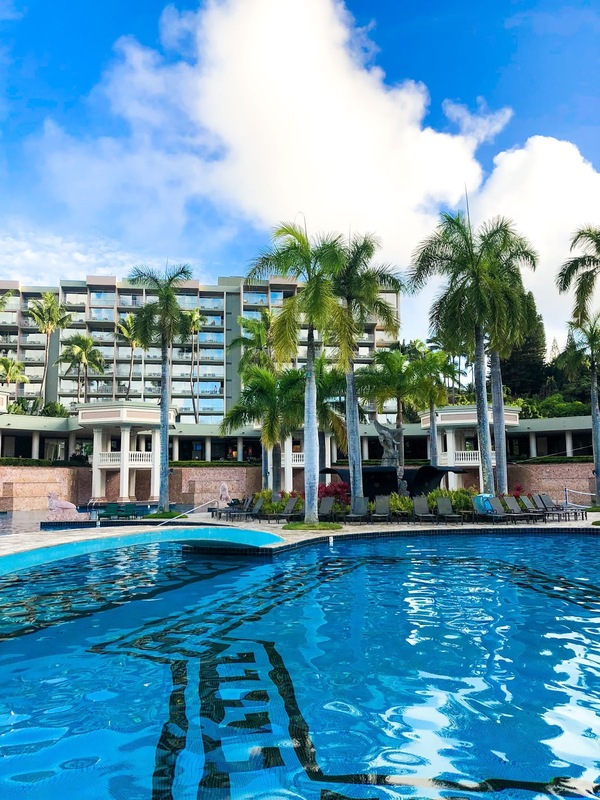 The resort also happens to have the largest single-level outdoor pool in the state of Hawaii. That paired with the 5 surrounding hot tubs made for an incredible pool day. Our room was amazing. The view alone was an incredible sight first thing every morning. We slept with the blinds open and let the cotton candy sunrises (and roosters) rouse us each day. It was incredibly spacious, two double beds, a pull-out couch with a coffee table, full size desk and bistro table over looking what I imagine to be the best view in the house. Everything was clean and always stocked, thanks to the amazing housekeeping staff who took perfect care of us each day. To say it was hard packing up on departure day is a bit of an understatement. 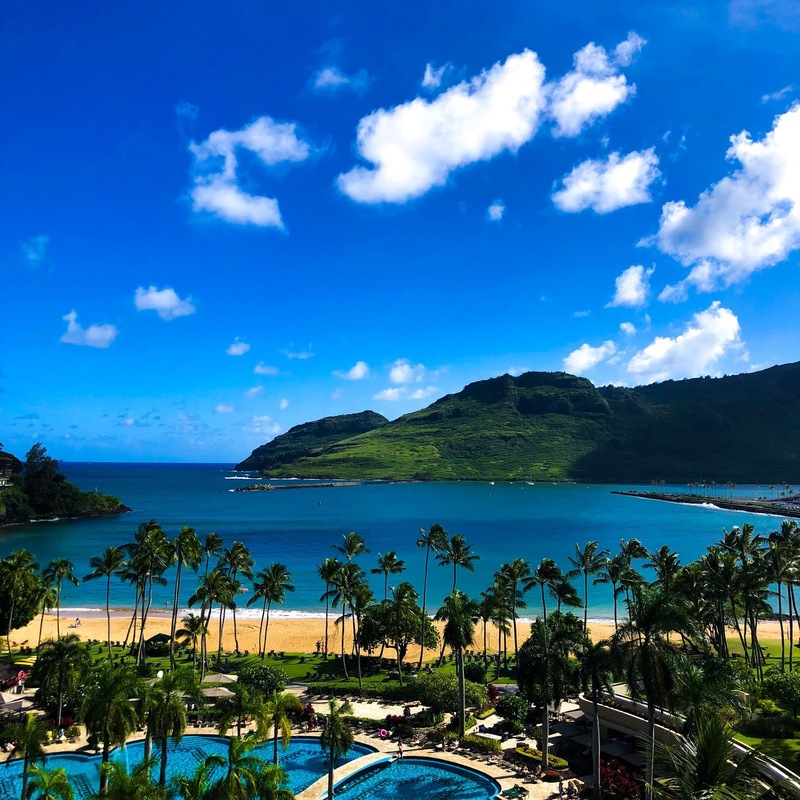 The resort just so happens to be on one of the most swimmable & kid-friendly beaches on the island, Kalapaki Beach. WIN! The picturesque cove has mild waves and frequents cruise lines that dock throughout the week. Make your way down to the beach for a swim, surf and/or game of beach volleyball. Lounge on a beach chair for a front-row seat to watching surfers, paddle boarding and swimming. 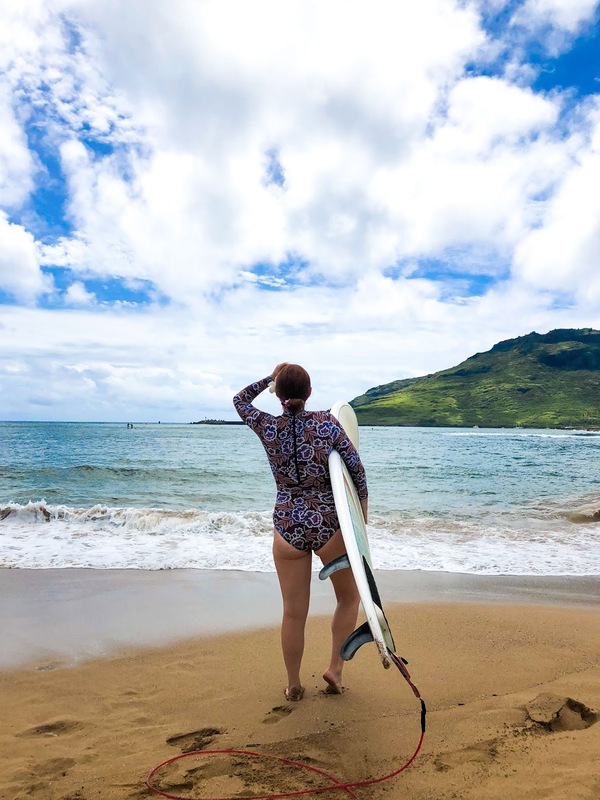 One of the perks of being on Kalapaki Beach is it's a great place to learn all kinds of water and wave based activities. The surf is great for beginners and reliable thanks to the reef break. Rent yourself a long board for $35 a day from the Kauai Beach Boys shack on the beach and paddle out. Not ready to catch a wave? No problem, they also have kayak and stand up paddle board rentals available. They even have daily Catamaran cruise tours. Of course the resort also has an extremely helpful concierge service that can help you book an array of excursions throughout your stay. While we spent a good majority of the time eating poké from Foodland, the resort had several delicious options for dining on-site. We were exhausted our first night on the island and ended up ordering room service and watched cooking shows before "conching" out before 8pm. The food was quick and hit the spot. Throughout the following days we dined beachfront at Kukui's on Kalapaki Black and Duke's Kauai. Other options include Italian from Cafe Portofino, stop in breakfast options at Aupaka Terrace, & sushi at Toro-Tei Sushi Bar. They also have a Hawaiian luau every Monday night. 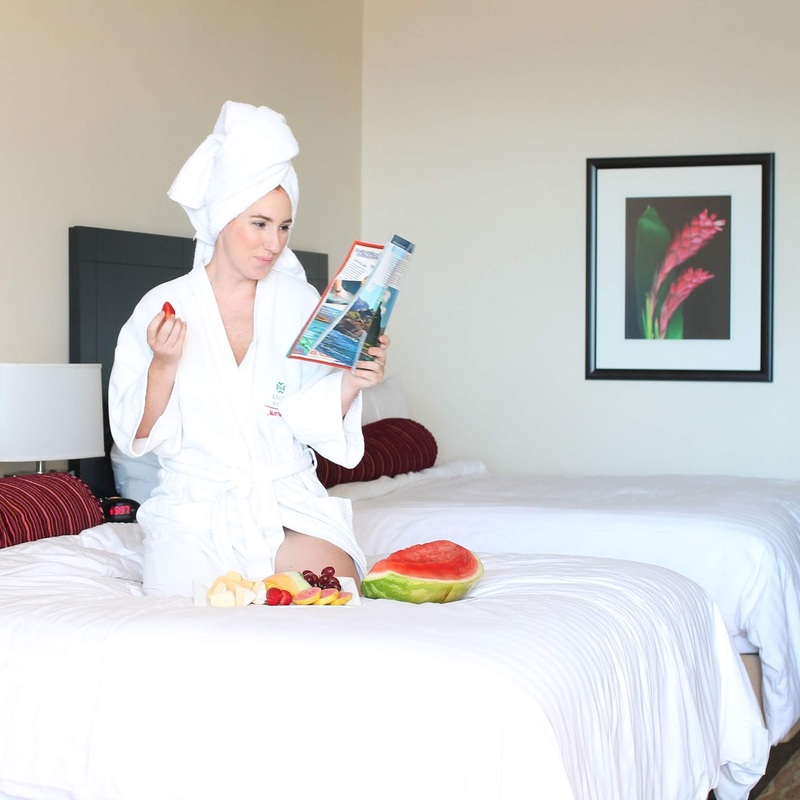 When we checked in we were handed a calendar with hour-by-hour listings of activity options during your stay for both adults and children. Some were complimentary and some required a small fee. They had everything from movies on the beach to lei making classes. We popped into a couple of activities such as the torch lighting ceremony, movie night and s'more making. So, if you get tired of wandering the island there's plenty to do at the resort each day. 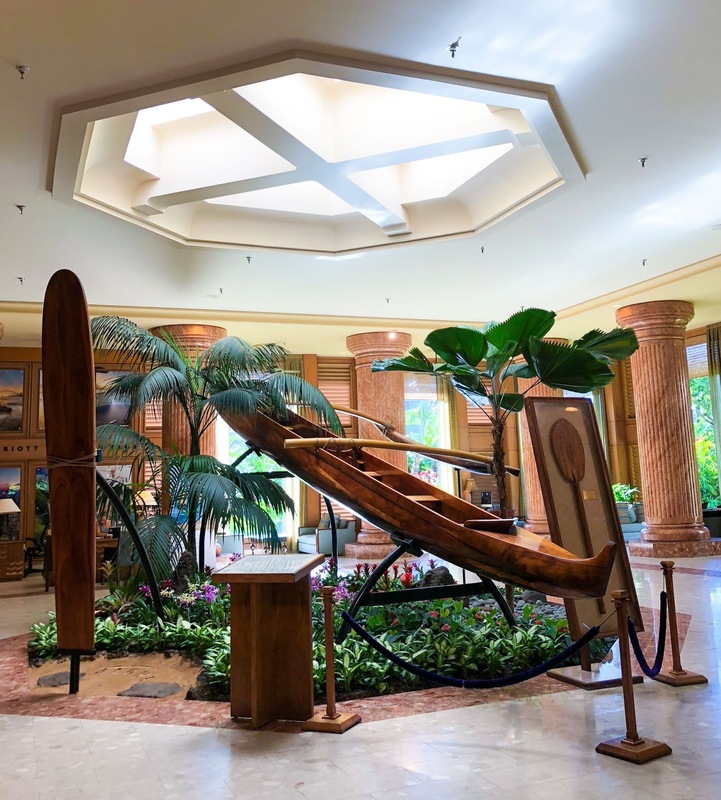 While I didn't see a huge amount of kids on our trip I was definitely on the lookout for activities and special attractions for future use for my boys. One, they have a children's pool with a waterslide for kids up to 12 years old. It was just the right size and the kids looked like they were having a blast. They have a huge variety of kids activities to keep kids busy between excursions, beach time and pool time. Massages on the beach? Yes, please. The Kauai Marriott Resort has it's very own full service spa that leaves you feeling pampered and refreshed. Pricing ranges from $45 for a blowout to $125 for a 50 minute massage on the beach. This post is sponsored by Marriott. All opinions are my own.